Australian visitor Kirk Gibbs and Hamilton-based former Mangakino rider Kayne Lamont had responsibilities to tackle the premier MX1 class at Sunday’s opening round of four in the Fox-supported New Zealand Motocross Championships near New Plymouth and Mangakino’s Maximus Purvis was the team’s MX2 (250cc) class representative. When the engines were finally shut down at the end of racing late on Sunday afternoon, all three sportsmen were on their respective podiums. Defending New Zealand MX1 champion Gibbs won the day’s first MX1 encounter, leading Mount Maunganui’s Cody Cooper ((Alpinestars Motul Honda CRF450) past the chequered flag, with Lamont settling for third spot, and so the battle lines were drawn in what promises to be a hot national series. Cooper bounced back to win the next two MX1 races, with Gibbs and Lamont second and third respectively both times, but there was really nothing between these three riders as they battled for the lead, well ahead of the chasing bunch. It is a solid start for Gibbs in his title defence, with just three points his deficit to Cooper, and equally it was a positive performance from Lamont, still on the comeback from an injury sustained in November. The riders will now move on to round two in Rotorua in two weeks’ time, the track there a happy hunting ground for Gibbs, who won the corresponding event there last season. “I’m feeling really good on the bike. Today was decent, but off the start in the last MX1 race I got sideways out of the gate and dropped the bike. I was dead last,” said Gibbs. Meanwhile, in the MX2 class races, Purvis had his work cut out battling fellow international stars Hamish Harwood (CML Makita KTM) and Wilson Todd (LMC Husqvarna). Purvis convincingly won the first MX2 class race of the weekend, his riding style as smooth as it was fast, reminiscent of his performance at the same track two weeks earlier, when he had won the MX2 class at the annual King of the Mountain Motocross. But Australian MX2 champion Todd won the next race and defending New Zealand MX2 champion Harwood won the final race of the afternoon. Purvis had to pick up the scraps after becoming tangled in traffic, the teenager eventually fighting through the congestion to finish sixth in race two and then third in race three. Harwood has a nine-point lead over Todd and Purvis, the two riders in equal second after their mixed bag afternoon. 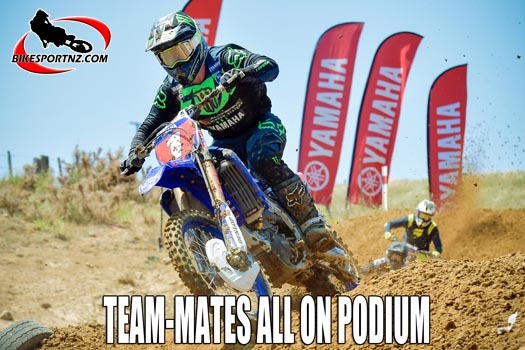 Altherm JCR Yamaha Racing Team manager Josh Coppins was both satisfied and disappointed with the results achieved by his riders. “It wasn’t too bad, but it should have been better,” he shrugged. “Max made a little mistake in his second race, which cost him. And Kirk made a mistake in his last race which cost him. Kayne was solid all day, especially given where he came from with not having the fitness. Overall I guess we can be content. “From a team point of view, I think we nailed it. I personally think it’s now up to the riders from here on. The bikes are good, but the riders need to execute things a little better and make fewer mistakes.